18" Black Walnut Picker Upper - Black Walnut Cracker for Serious Nut Crackers! Save time and invest in the Bag-A-Nut 18" Black Walnut Harvester! 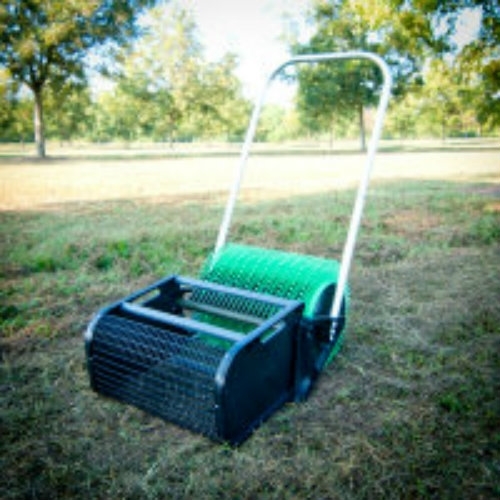 This quality construction farm equipment makes picking up a wide variety of nuts as simple as a push and a lift. Instead of bending down for your nuts (and staining your hands! Breaking your back! ), simply push this nut picker upper and watch as the device "grabs" the nuts and empties them into the nut basket. Once full, just lift the basket, empty the nuts, and return to pushing for more nuts. With the 18" push design, this nut picker up yields 50% more than the base model! More results! More nuts! The nut grabber for you! Bag-A-Nut Harvesters are built in the United States. A quality construction, this sturdy nut harvesting equipment is designed to be easy to use and to last for many years to come! The whole family can help in the harvest with this lightweight design. Fast and easy nut picker upper! I think of all the time I've wasted in my life before this device came into my life. Waste no more. Very effective. One of my favorite purchases.